This is Scolosaurus, a skeleton I’ve written about before a couple of times. I first got a chance to look at it back in 2009, and it was great to be able to do so again – I’d happily spend weeks just staring at this fellow. It’s one of the very best ankylosaurid skeletons out there, preserving the neck through the free caudals in articulation, along with most of the osteoderms and skin in their original positions. Somewhat confusingly, the right arm and leg are both missing, but the left arm and leg are in good shape. Most frustratingly is the absence of a skull or tail club. I am sure they were part of the skeleton when it was discovered, but this specimen has an unusual backstory: it collapsed on Cutler while he was excavating it, and the Sternbergs finished the job. I am pretty sure that sitting out there in the Alberta badlands is a big hole with the head at one end and the tail club at the other. Darren Tanke has done a herculean job trying to relocate this important mystery quarry (you can see some of his work trying to find it in the Dino Hunt episode ‘Cutler’s Cave’ if you’ve got American Netflix), but the exact spot remains elusive. One day!! 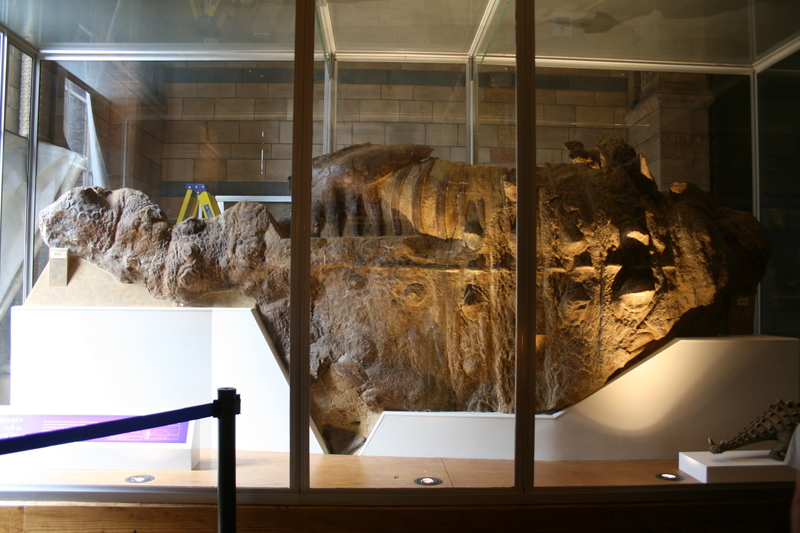 Anyway, one thing you may have noticed from the previous photo is that Scolosaurus is locked away in a dramatically lit case, which happens to live in the public dinosaur galleries at the NHM. 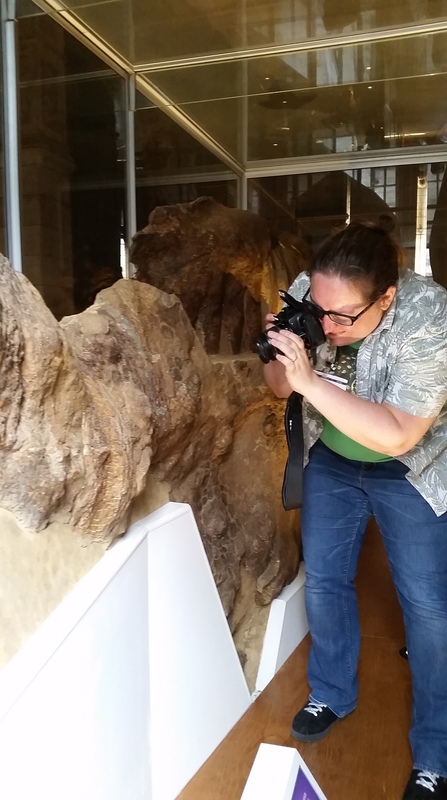 This makes it a little bit hard to study this particular fellow – glass keeps prying hands away but also makes it difficult to photograph and to take measurements or detailed observations if you’re, say, someone who likes to do such things to ankylosaurs on a regular basis. Luckily for me, Susie Maidment, palaeontologist at the NHM, arranged for the Scolosaurus case to be opened during my visit! It’s a bit too difficult to remove the whole case, but the end towards the tail can be opened with a bit of finagling. 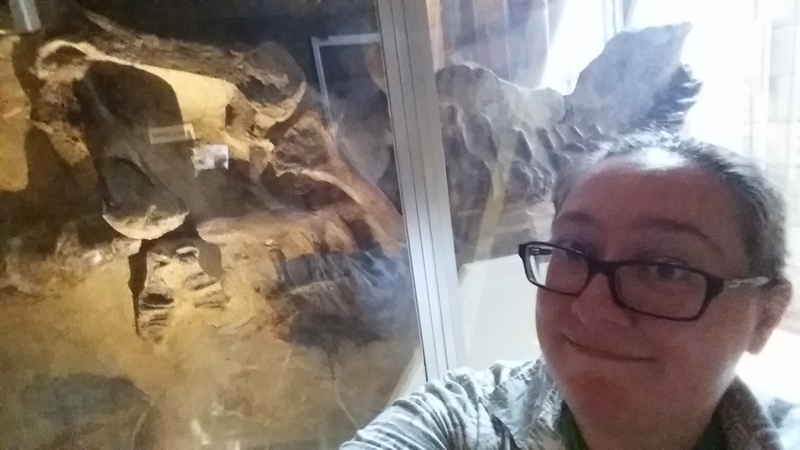 This meant I got to inch around inside the case with the specimen – a thrilling if also terrifying experience, since there’s basically just enough room between the glass and the specimen for me to occupy. 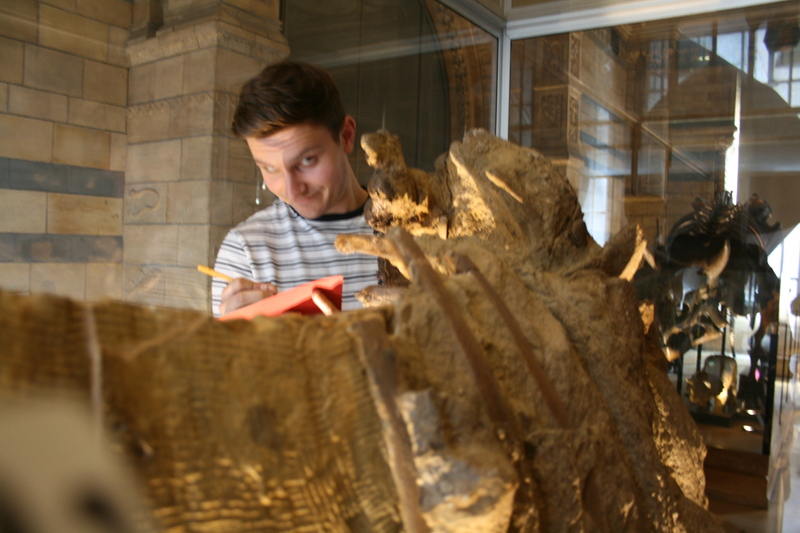 Susie’s PhD student Tom Raven also took advantage of the open case! Together we were able to comprehensively measure all the interesting stuff on the skeleton – thanks for your help with this, Tom, as it would have been genuinely difficult to juggle both a notebook and measuring tape/calipers in this cramped space! The opportunity to get behind the glass meant I could get some nice pictures of the skin! This segment is near the base of the tail, towards the hips. 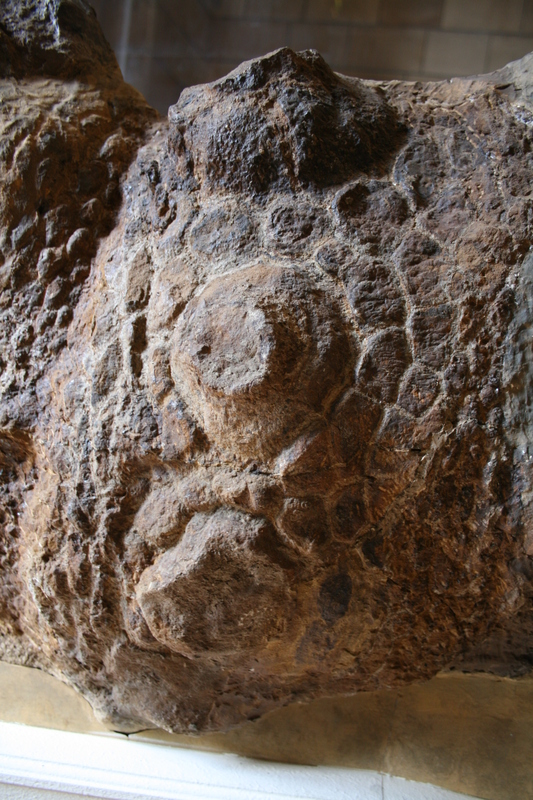 You can see 4 osteoderms – 2 medial and 2 lateral – arranged in a transverse row, and surrounded by rosettes of scaly skin. Towards the bottom right of the frame you can also see a bunch of small black dots, which are the millimetre-sized osteoderms called ossicles that fill the space under the scales and between the bigger feature osteoderms. The data I was able to collect on Scolosaurus is interesting in and of itself, but will also be really helpful once Zuul’s postcrania are fully prepared. We’ll be able to compare in detail how the armour differs between these two species, and will be able to get a better sense of the amount of variation in ankylosaurin armour and skin. On that note, preparation of Zuul’s belly has really rocketed forward over the last month at Research Casting International, and we’re looking forward to seeing the block flipped in the next few weeks so preparation can begin on the armour/skin side (hopefully revealing preservation similar to what we see in Scolosaurus!). Until next time! *Bonus secret Scolosaurus fun fact! In The Land Before Time, Littlefoot meets a grumpy old dinosaur named Rooter of somewhat ambiguous taxonomic affinities. I’m like 99% sure Rooter is meant to be a Scolosaurus despite his weird head – if you look closely in a few of the shots, you can see the short two-spiked tail that was common for reconstructions of Scolosaurus at the time (and based on a misunderstanding of what the broken holotype fossil showed for the tail anatomy). Btw, off-topic but, some time ago, you sank Nemegt Tarchia specimens into Saichania. In their paper, Penkalsky and Tumanova disagreed. Do you stand by your original view? If you replied to their view in a previous post or paper I missed it.